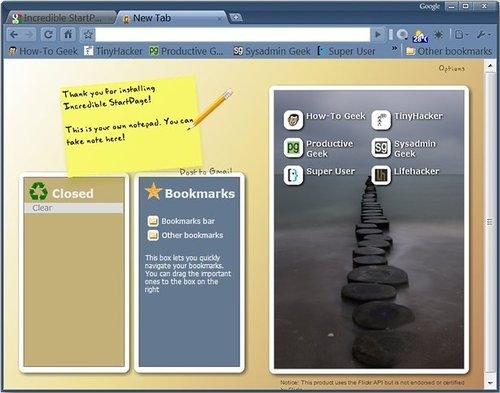 Chrome only: Google Chrome extension Incredible StartPage changes the start page to a three-panel view of your your favorite bookmarks, closed tabs, customizable color schemes, and a place to quickly add notes and send them to Gmail. Once you've installed the extension, just open up a new tab page to see the changes—you can customize the color scheme or flip through different pictures on Flickr by category. You can also browse through your bookmarks in the middle pane, and drag the most important ones to the box on the right-hand side for easier access. The extension could benefit from a few more customization options, but overall it's an interesting way to spice up your new tab page.